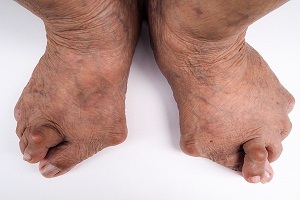 Welcome to DiseaseFix Section for Gout Disease. 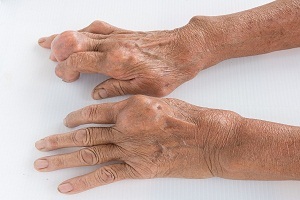 Gout is a commonly recorded medical illness of the joints. It is a form of arthritis that is caused by a build-up of uric acid crystals in the joints. It can affect anyone. It occurs due to abnormal metabolism of uric acid. Uric acid is generated when breakdown of purines occurs. What Does Gout Look Like? How Do You Know You Have Gout? Gout is a medical condition and a type of arthritis which causes discomfort and pain in the joints. Its typical symptoms are characterized by the sudden onset of severe pain, swelling, warmth, and redness of a joint. The clinical presentation of gout is not faint but marked and some are mimicked by bacterial infections. Most Common Places For Gout: Where Do You Get Gout? Almost 90% of the times, gout involves joints in the lower extremities of your body. The classic location for gout to occur is the large joint in the big toe. Podagra is the medical term for inflammation at the base of the big toe. However, gout can also affect many other joints. Does Gout Go Away On Its Own? Can You Permanently Cure Gout? Every joint in your knees, wrists, toes, and ankle is devoid of any pain and inflammation. Then there is emergence of the uric acid, a by-product of purine breakdown. Due to its low solubility in humans, it gets deposited and can easily crystallize in the synovial joints, especially at low temperatures. Duration of Gout and Gout Attacks: How Long Does Gout Last? You should remember that your gout problem doesn’t appear suddenly but actually been with you for quite some time, possibly years. It is caused by continuous uric acid build-up in your blood. If you don’t control your uric acid levels, you should expect more and frequent gout attacks. Individuals living with gout can face challenges, pain and unpredictability, especially if lifestyle changes haven’t brought their uric acid levels down to normal. If gout attacks become more frequent, you may develop chronic gout, which can stress other systems in your body, especially your renal system.